Want to have your site listed here? Contact us and we’ll swap links. Wayne Township, New Jersey: The community Preakness Volunteer Company 4 has served for over 80 years! Volunteer Fire Company 1: First due to the South side of Wayne Township, including Willowbrook Mall, Rt.23&46. Volunteer Fire Company 2: First due to the South Side of Wayne Township, including Willowbrook Mall, Rt.23&46. Volunteer Fire Company 3: First due to the Northwest side of Wayne Township. Volunteer Fire Company 5: First due to the Midtown area of Wayne Township & provides Rescue Company Ops. 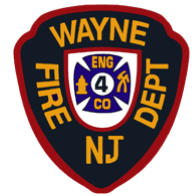 Wayne Township Memorial First-Aid Squad: Providing volunteer EMS services to Wayne Township. firehouse.com: An excellent resource for fire fighters and emergency responders the world over. First Responder Broadcast Network: Breaking news from around your town and around your world. Paterson Fire Department: Serving Paterson...aka ’Silk City. Photoz on Fire: Ron Johnson is a very talented freelance photojournalist with some spectacular fire photos. Hawthorne Fire Company: The new Hawthorne Volunteer Fire Department website is pretty good! West Milford Fire Company: Home of the Black Sheep! FDNY Trucks: The largest archive of fire apparatus photos in the world! National Fire Protection Association: Non-profit provides standards, research, training, and education. Federal Emergency Management Agency: FEMA’s mission is to support our citizens and first responders. National Volunteer Fire Council: A non-profit representing volunteer fire and rescue services. New Jersey Forest Fire Service: Only you can prevent forest fires... but we put them out.